I'm starting to settle down!!!! Well the past couple months have been hard for me to sit still. I think I am finally settling down. The Yarn Harlot(Stephanie Pearl McPhee) has been here and left. 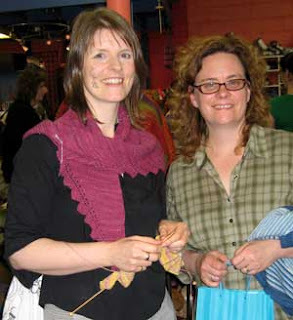 Stephanie from Space Cadet yarns has been here and left and now the next event will be Knit in Public Day! What a delightful weekend all of us willing students had. What a humbling weekend we had trying to master new skills and take in the amazing amount of information that Stepahnie shared. And then again, there was just plain old fun. I have some pictures to share with you now and there are some great ones that were posted to our Facebook page. If you haven't already, please become one of our friends. We delight in meeting new people as we continue to build this amazing fiber community. 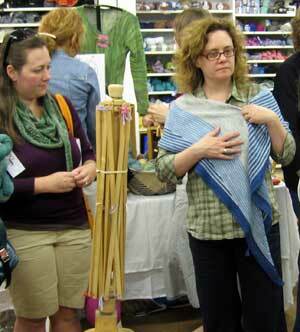 So what you see here is the Harlot modeling her Color Affection Shawl during a discussion about how to wear it. The other photo is the two Stephanies that came to visit this past weekend....Space Cadet Yarns and The Yarn Harlot. Thanks to the two of you for a great weekend!